These comments provided by Neurotechnology are based on NIST MINEX III results published on August 8, 2018.
the second most interoperable PIV Level 1 MINEX III compliant template generator and matcher pair. circa 1.5 times improved interoperability PIV Level 1 (comparing to predecessor on-card comparison submission) MINEX III compliant template generator and matcher pair. Neurotechnology+0206 – the latest Neurotechnology fingerprint recognition algorithm advancement, designed for use in solutions employing card holder biometric verification on Integrated Circuit Cards (smart cards). Neurotechnology+0204 – the recent Neurotechnology fingerprint recognition algorithm, designed for use in solutions employing card holder biometric verification on Integrated Circuit Cards (smart cards). Data from NIST report dated January 16, 2018. This is the last report before the Neurotechnology+0108 submission replaced Neurotechnology+0107 (which was initially submitted in January 2017) withing MINEX III pool. MINEX III evaluation protocol limits the number of single-vendor submissions within present evaluation to two. The best native accuracy vendor submission becomes a member of the pooled DET curves and reported pooled PIV Level 1 values. Data from NIST report dated April 17, 2018. This is the last report before the Neurotechnology+0206 submission replaced Neurotechnology+0204 (which was initially submitted in October 2016) without altering the MINEX III pool. MINEX III evaluation protocol limits the number of single-vendor submissions within present evaluation to two. Figure 1. Performance and interoperability of Neurotechnology's MINEX III compliant template generator. Figure 2. Performance ant native accuracy of Neurotechnology's MINEX III compliant template generator and matcher pair. Figure 3. Interoperability (SP 800-76-2 PIV Level 1) and native accuracy (SP 800-76-2 PIV Level 2) of Neurotechnology's MINEX III compliant template generator and matcher pair. The tables and figures above represent performance and reliability estimates of Neurotechnology's MINEX III compliant biometric software submissions published January 16, 2018, April 17, 2018 and August 8, 2018. The Neurotechnology+0108 submission represents the latest advancement in Neurotechnology's fingerprint template recognition algorithms designed for use in solutions based on PC or mobile platforms. The submission successfully passed the MINEX III validation in April 2018. The outstanding interoperability results for Neurotechnology's latest fingerprint template generation technology, as well as the top-ranked native accuracy for fingerprint recognition (generator and matcher) software, easily exceeds any previous MINEX III submission. Simultaneously with the latest Neurotechnoloy+0206 submission detailed above, the Neurotechnology+0108 template generator ranks first for interoperability among all of the 17 submitted MINEX III compliant template generators, outperforming the closest vendor submission by 1.4 times at PIV Level 1 interoperability for pooled, two-finger matcher criteria. It has demonstrated consistent interoperability, both with outside vendor products and Neurotechnology's own native predecessors (e.g., Neurotechnology+0204). In the latter instance, two-finger native fidelity improved by roughly 1.25 times. 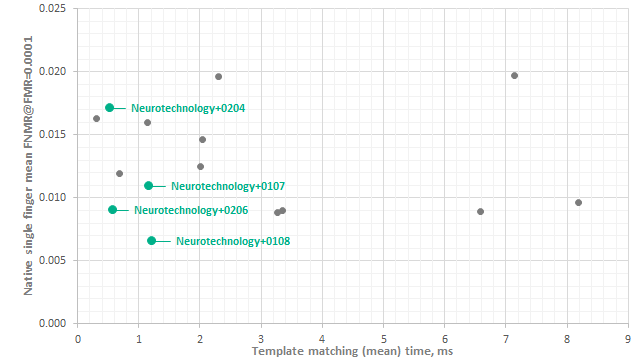 The Neurotechnology+0108 template generator and matcher pair has also been evaluated as the most accurate software submission for PIV Level 2 mean native, single-finger matcher criteria, outperforming the closest competitor's submission accuracy by 1.35 times at a 2.67 times higher matching speed. 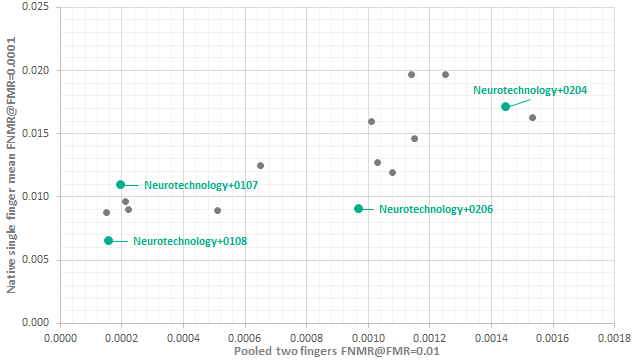 The matcher software has been also ranked as the 2nd most interoperable submission with FNMR at FAR ≤ 1 % minor absolute deviation value being 0.001 % with respect to targeted FNMR ≤ 1 % at FMR ≤ 1 % PIV Level 1 two-finger criteria. This MINEX III result positions Neurotechnology as the leading template-generator software provider, assuring generated data applicability in a deployed biometric system's successive evolutionary stages, both within a cross-vendor or a cross-version interoperable environment. It also consolidates Neurotechnology's position as the first choice among fast and interoperable fingerprint matching software providers and the leader in prime native performance. The Neurotechnology+0107 submission corresponds to the recent Neurotechnology's fingerprint recognition algorithms, designed for using in solutions, based on PC or mobile platforms. The submitted algorithm successfully passed the MINEX III validation in January 2017. It incorporates significant improvements in Neurotechnology's fingerprint recognition technology since the first MINEX III submission in 2015, with a reported 1.34 times improvement in PIV Level 2 mean native single finger matcher criteria and a 1.8 times improvement in PIV Level 1 interoperability pooled two-finger matcher criteria; this while testing on a wider ranging pool of MINEX III compliant generators. This result highlights Neurotechnology+0107 as outstanding in terms of interoperability, a leading recognition solution in two-way interoperability scenario. The Neurotechnology+0206 submission represents the latest advancement in Neurotechnology's fingerprint template generation algorithm in combination with the latest MegaMatcher On Card fingerprint matching algorithm for performing card holder verification on smart cards. The submitted algorithm successfully passed the MINEX III validation in August 2018. 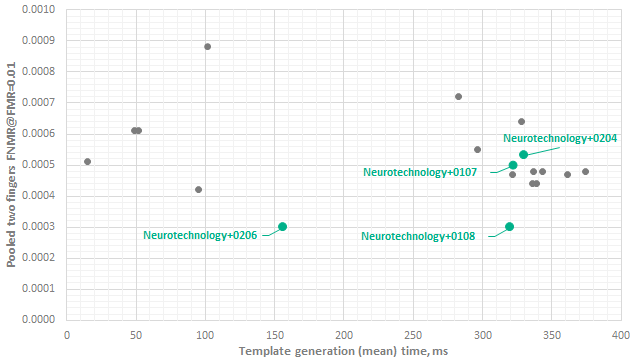 The submission has consolidated top ranked outstanding interoperability of the template generator also demonstrated by Neurotechnology+0108, but at more than 2 times improved template creation time. This positions the leading template generator Neurotechnology+0206 as the second fastest among the top 10 most interoperable MINEX III compliant generators leaderboard reported by NIST, while outperforming remaining vendors leaderboard algorithms by at least 1.4 times at pooled two-finger PIV Level 1 criteria. Compared to the 2016 predecessor on-card comparison dedicated biometric software submission, Neurotechnology+0204, the latest template generator exhibited in average 1.8 times better PIV Level 1 interoperability utilizing templates generated at more than 2.1 times lower timings. The template generator and matcher pair also demonstrated substantial improvement in its reliability with 1.5 times lower error rate for average two-finger interoperability PIV Level 1 criteria and 1.9 times improved native single finger accuracy PIV Level 2 criteria. Neurotechnology+0206 also ranked as the second fastest template matching algorithm within the top 10 most interoperable MINEX III compliant matcher leaderboard while outperforming in terms of both interoperability and native accuracy the fastest as well as many other vendor matching algorithm submissions likely dedicated to platforms with considerably higher computational capabilities than smart cards. The Neurotechnology+0206 template generator and matcher pair verifies it compliance with the minimal two-finger interoperability and single finger native accuracy NIST SP 800-76-2 specifications demonstrating 10 times and 2 times lower actual FNMR rates respectively. The Neurotechnology+0204 submission from 2016 corresponds to the recent Neurotechnology fingerprint template generation algorithm. It also includes the latest MegaMatcher On Card fingerprint matching algorithm for performing card holder verification on smart cards. The submitted algorithm successfully passed the MINEX III validation in October 2016. The recognition by NIST verifies Neurotechnology's off-card template generator applicability and the on-card comparison software's compliance with NIST SP 800-76-2 minimal interoperability and matching accuracy specifications. Compared to the 2015 submission, Neurotechnology+0105, this version of the algorithm showed a more than 1.22 times improvement in template generator interoperability with MINEX III compliant matchers while possessing almost the same average template creation performance. The fingerprint matching algorithm was rated as the second fastest template matching submission, while showing an approximately 1.11 times better interoperability with the MINEX III compliant template generator pool (PIV Level 1 criteria) compared to the fastest submission. See the MINEX III official page for more information on MINEX III extended testing criteria and the most recent evaluation reports. Results shown from the Minutiae Interoperability Exchange III (MINEX III) test do not constitute endorsement of any particular system by the U.S. Government.